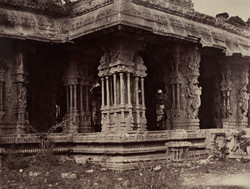 Photograph with a close view of the sculptured columns of a mandapa (hall) of the Vitthala Temple at Vijayanagara in Karnataka, taken by Andrew Charles Brisbane Neill in c.1856, from 'Architecture in Dharwar and Mysore'. Vijayanagara, the City of Victory, was the seat of a powerful Hindu kingdom in Southern India from 1336 to 1565. The kingdom was founded by two brothers, Harihara and Bukka, formerly chieftains with the Delhi Sultanate. Vijayanagara flourished as a prosperous centre of Hindu art, culture and architecture, until the Battle of Talikota in 1565 when it was defeated by the armies of a coalition of neighbouring Muslim kingdoms, its rivals for supremacy in the Deccan. The ruins of this vast royal city on the bank of the Tungabhadra River lie surrounded by granite hills. The site is also known as Hampi, together with a small local village nearby. The Vitthala temple, dedicated to a form of Vishnu, is one of the greatest monuments at the site. It is thought to date from the first quarter of the 16th century. The temple complex consists of a rectangular courtyard surrounded by cloisters and entered by three gateway towers or gopurams. The main sanctuary occupies the centre and it is surrounded by other structures, mostly multi-columned pavilions or mandapas, both open and closed. The external piers are carved as rearing animals with riders and have elaborate brackets.